With some simple DIY skills, you can make your own canvas painting boards. Making your own canvas boards is fun, quick and saves you money. It also gives you a superior product and the flexibility to create whatever size or shape you need for any given project. You don’t need any specialist skills or tools and you can pick up everything you need from any hardware or DIY store. It's also a great way to explore new painting techniques without splashing loads on money on boards. 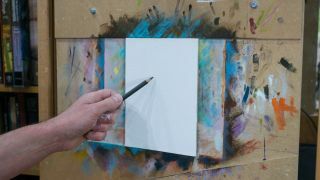 To start making your own canvas boards you will need 3mm thick MDF, a metal ruler, a pencil, a utility knife, canvas material, sandpaper, primer, a priming brush and a cutting mat. A good right angle is a handy tool for checking your corners are 90 degrees, but it isn’t essential as long as you take care with your measuring. Check you’re working from a good corner on your sheet of 3mm MDF and measure up the desired dimensions of your board. Once marked up you can cut the board with the knife, using the metal ruler as a guide. Start lightly and let your knife do the work. It will take a few runs to cut through the board. Take care, fingers don’t grow back! Once you’ve sanded down the cut edges (do this outside and wear a mask if possible as MDF dust is nasty), you’re ready to paint a coat of primer on the front of your panel. Take your canvas, apply it to the wet primer and press firmly. Take care to line up the weave of the material so it runs perpendicular to the edges of the board. Bonus tip: Painting onto a smooth board can give great results too, so you don’t even need to add the canvas to the board. Follow steps 01 and 02 then just prime the board a few times, giving it a light sanding between coats. Paint another coat of primer on the canvas and allow it to dry thoroughly. Repeat this process a few times to create a really solid surface, depending on how much of the weave you want to retain. Once completely dry, flip the board over and trim the excess canvas to finish your hand-crafted canvas board.